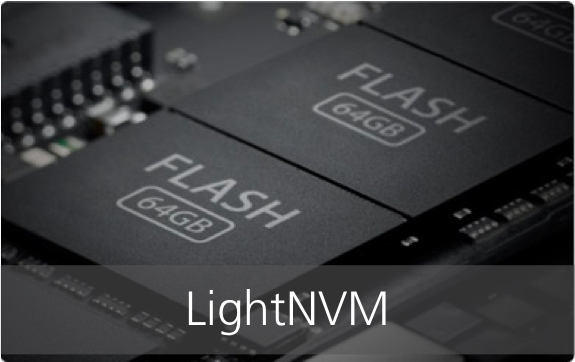 LightNVM is a host-side driver for Open Channel Solid State Drives. Open-Channel SSDs are devices that share responsibilities with the host in order to implement and maintain features that typical SSDs keep strictly in firmware. These include (i) the Flash Translation Layer (FTL), (ii) bad block management, and (iii) dedicated hardware units such as the flash controller, the interface controller, and large amounts of flash chips. The motivation behind moving certain responsibilities to the host is to make I/O data commands predictable from the host-side. In this way, the device enables the host to adapt the FTL algorithms and optimizations to match the appropriate user workloads that it executes. The Linux host architecture for Open-channel SSDs is depicted in Figure 1. It consists of four fundamental components: LightNVM compatible device driver, framework manager, media manager, and targets. LightNVM device driver. The device driver is responsible for implementing the storage protocol use for communication between host and SSD. A device driver instance is created for each connected Open-Channel SSD. It relies on the Linux block manager to handle command submission/completion, timeouts, and tags. Currently, LightNVM uses NVMe, which is extended with (i) identify device structures, used by the host to discover the available features, extensions, and characteristics of the device; and (ii) and a series of custom commands, which enables the host to issue I/O commands that act directly on the physical media. Framework Manager. The framework management acts as a mediator between device drivers, media managers and targets. It provides supporting functionalities for device initialization, teardown or accounting. Media Manager. The media manager abstracts the underlying physical media by hiding its constraints and access details. It is responsible for (i) name mapping between vendor specific and generic addressing format, (ii) device-specific SSD state management, and (iii) recovery – to guarantee durability when manipulating the metadata associated with SSD state management. Each media manager implementation can vary much depending on the needs of upper layer it is exposed to. LightNVM’s generic media manager implements minimal block management and let targets or user space applications implement the actual FTL. Still, it is possible for a media managers to implement the whole FTL and manage user space interfaces. For example, a media manager could expose a block device similar to a traditional block storage device. Such a media manager would manage functionalities such as data placement, garbage collection and block management. LightNVM Targets. When using the generic media manager, targets implement FTL functionality (e.g., translation logic, data placement, or garbage collection). They also expose a storage interface to user space. Examples of such interfaces include block devices, and key-value stores, or object stores. Custom interfaces can also be implemented. Target and device (media manager) division, grouping and assignments are flexible in such a way that one device can be split and assigned into multiple targets or multiple devices can belong to one target. Additionally, LightNVM connects to user space through liblightnvm, which exposes a get_block/put_block interface for applications to implement their own FTLs. This document describes the interface for communicating with an Open-channel SSD. This version also introduces NVMe protocol extension to support Open-Channel SSD interface based on the NVMe revision 1.2 specification. An example of a shared responsibility configuration is the following: The host manages data placement, garbage collection, and has knowledge about the parallel units within the device to schedule and manage I/O streams. The device manages bad blocks and maintains the mapping tables. The device implements hardware extensions to support atomic IOs and metadata persistence too. These are exposed to the host through a common interface. The baseline is that Open-channels SSD expose direct access to their physical flash storage, while keeping a subset of the internal features of traditional SSDs. The responsibilities that are delegated to the host depend entirely on the device capabilities. Currently, LightNVM is hooked up through the null_blk and NVMe driver. The NVMe extension allow development using the LightNVM-extended QEMU implementation, using Keith Busch’s qemu-nvme branch. The whole project, which includes a LightNVM, liblightnvm, QEMU support, sanity checks, and other tools can be also found in GitHub (here). General documentation can be found here; the Open-Channel SSD specification can be found here.